If you drive a clunker, you are the darling of the auto world, at least until the $1 billion runs out or November 1st arrives which ever comes first. That’s right Cash for Clunkers was signed into legislation on June 24 and is expected to be active on July 23. The CARS (Cash Allowance Rebate System) legislation is a convoluted version of several European Cash for Clunker programs that have spurred automotive sales. The US has been considering adopting a similar program and finally passed a complex version that was signed by President Barack Obama. With so many rules and restrictions to determine if your clunker is eligible, several automakers have rolled out their own initiatives to attract these shoppers and help them navigate through the requirements. The requirements include poor fuel economy numbers, model year of the car or truck, and the newly purchased vehicle must get better, though not much, gas mileage than your clunker. If you want the gory details checkout the CARS.gov website. When searching Google, I received the following results with paid search results from GM, Toyota, and Ford. Mazda, Nissan and Kia also occasionally show up in the paid search results. Several OEMs are highlighting their sites as helpful ways to lead you into a particular brand’s products. The most interesting marketing example comes from SMART with its full product line of a whopping two cars that fully meets the CARS requirements, no matter what clunker you are scraping to give you the maximum $4,500 credit. Combined with SMART’s $99 payment promotion, the SMART Cash for Clunkers marketing pitch seems like a good blend of reaching cost conscious and green minded consumers. Of course, this means you have to be willing to risk your life driving a fortwo; though, this may not be a problem if you have been flaunting with death in a 1986 Dodge Omni with bald tires and a oil leak that leaves a trail from your home to work every morning. SMART is also actively building up their contact database to keep interested buyers informed the minute the plan goes live. 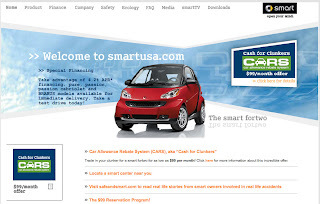 “Sign up today to receive notification of available inventory and details regarding smart fortwo express delivery to a dealership near you,” reads the SMART Cash for Clunkers page where people can leave their contact information to get a follow up when details come out. So the battle to get those clunker dollars is in full swing and brands are trying their best to help you navigate if you qualify and help you navigator you and your clunker into their dealership. I like how you have presented the information in full detail. Keep up the great work and please stop at my site sometime for more Car Body Kits information. Keep it up.. Thanks. Yeah I have checked out your site. I think my next car will be a Ford Fusion Hybrid that I want to give a sporty, aggressive look to so I'll have to look more at your site when that day arrives, hopefully next summer. Thanks again.